February 2, 2016 is the fourth annual Rheumatoid Awareness Day. 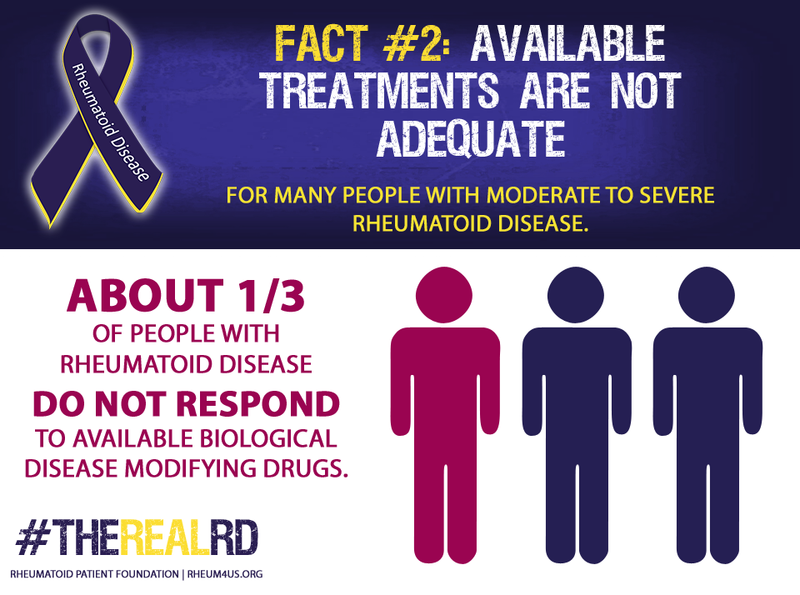 The theme for Rheumatoid Awareness Day 2016 is the real rheumatoid disease, abbreviated with the hashtag #TheRealRD. 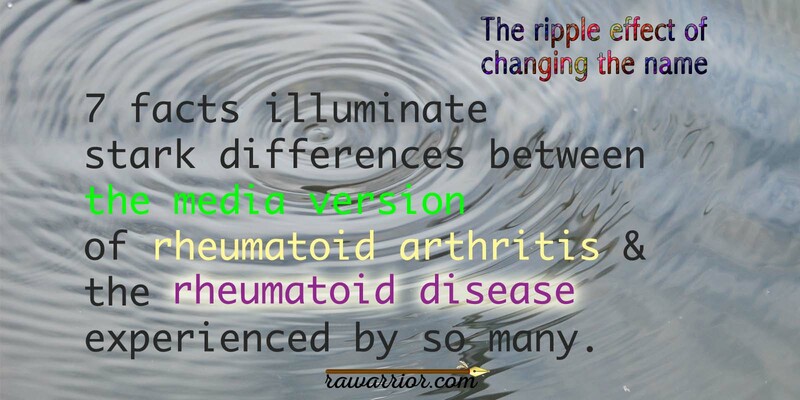 Seven facts illuminate the stark differences between the media version of rheumatoid arthritis and the rheumatoid disease that’s experienced by so many. 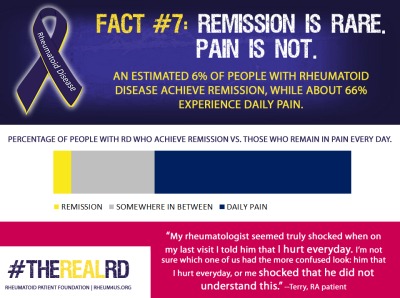 Sharing these 7 #TheRealRD facts is a positive way to combat the misinformation and minimizing that’s so typical with regard to rheumatoid disease (RD). You can click on the images to enlarge, feel free to save, and share. Which of the 7 Facts can you comment or blog about? 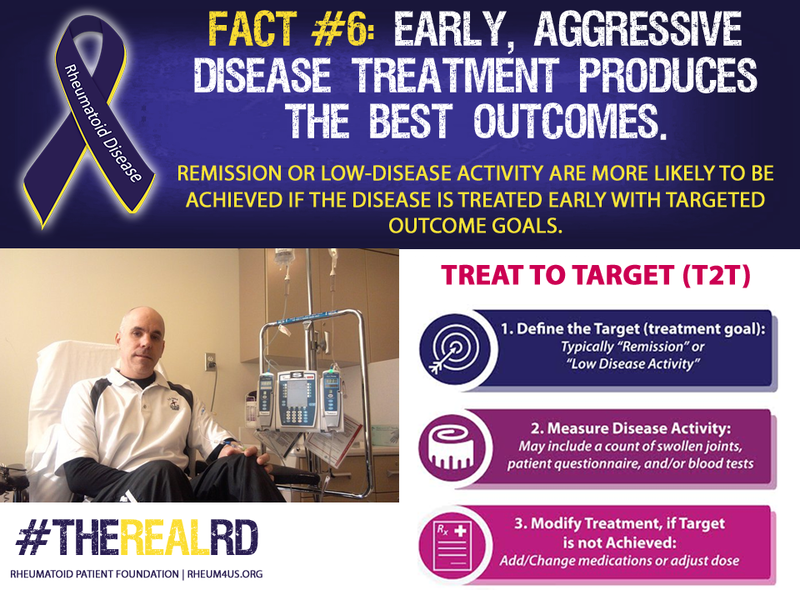 As you read 7 facts, if you’re a reader of RA Warrior, you might be tempted to shrug, “Oh I know that.” But as you read #TheRealRD facts, which one might have make a difference to you if the world understood it? Which ones do people have difficulty grasping? Thinking back, was there ever a time you misunderstood some of them? Click an image to enlarge, Pin, save, or pass on. I could write about all of them, and maybe I will. Number 7 strikes close to home. Everyone acts like my RD is an occasional problem. They seem to think the symptoms remit and I just have “bad days.” But that doesn’t relate to my experience at all. We’re not all the same (see Fact #3). I live every day at least 80% disabled and in pain like labor. It takes me hours to do what used to take minutes. When people hold on to a wrong perception of the disease, it affects the expectations they have. The resulting misjudgment and lack of accommodation are devastating. Any of the 7 #TheRealRD facts would be a great blog post topic in honor of Rheumatoid Awareness Day. If you have any kind of blog, you can write a post this week using one of #TheRealRD facts. 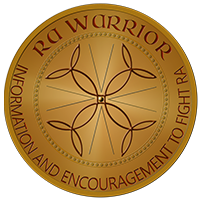 Email me the link and I’ll post it as part of a blog carnival here on RA Warrior, inviting people to visit your blog and helping spread your message. 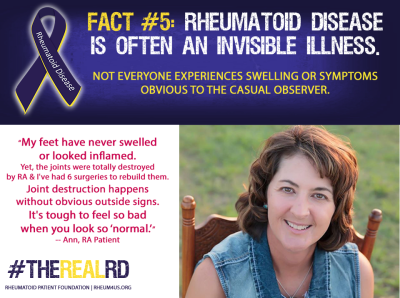 You are invited to join us at 8:30 pm EST February 2 – that’s TODAY – for a Facebook chat in honor of Rheumatoid Awareness Day. It’s easy & you don’t need to say anything to be there and enjoy the chat. Just click HERE and refresh the page every few minutes so you can see all the comments. To add an RD ribbon to your Facebook or Twitter profile, visit the Twibbon site here. We have made progress. However there is still mostly nonsense or mixed messages in the media and on medical websites. In Pennsylvania, February 2 was designated as “Rheumatoid Arthritis Awareness Day.” It’s a thorny discussion, but the whole purpose of establishing the day is acknowledging RD as a disease instead of a form of arthritis. That’s the first step to progress on awareness, improving the paltry research funding, or finding a cure. It’s fantastic how quickly Rheumatoid Awareness Day has taken hold. 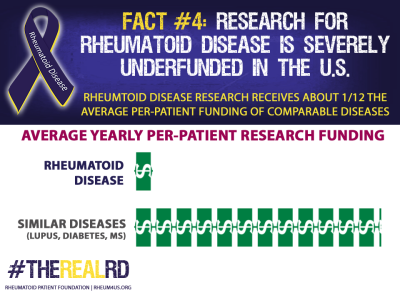 I’m thrilled to see February 2 listed on many websites, including Wikipedia, as the one day to acknowledge rheumatoid disease. 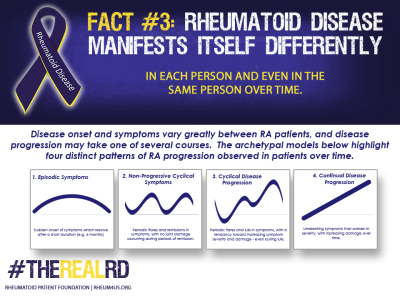 Many websites now say “rheumatoid disease” instead of “arthritis” because they know that minimizing RD is offensive to patients (who they want to click and read their stuff). Meanwhile Glenn Frey’s cause of death put the seriousness of RD on the radar. During that time, half a million people viewed our Facebook Page. Most wanted the world to understand seriousness of RD. 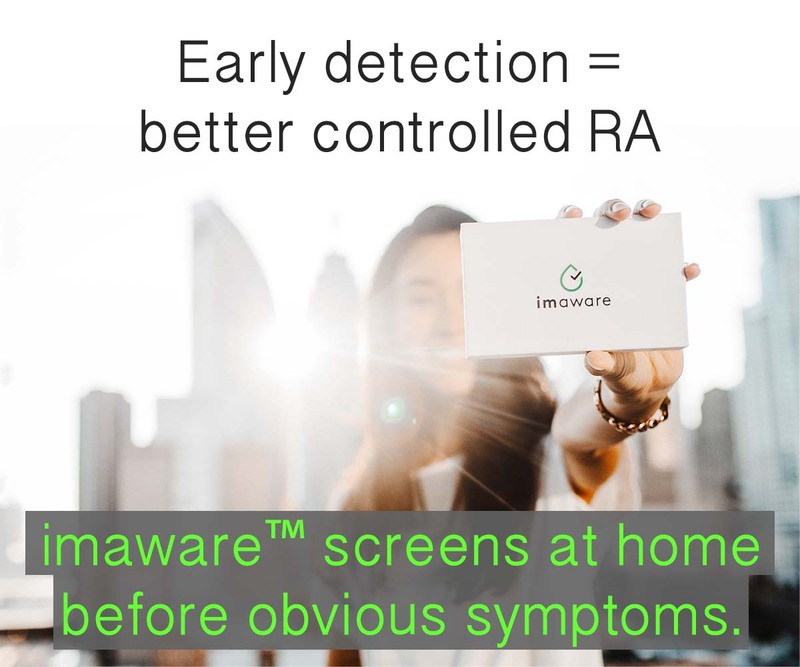 Learn more about the history and purpose of Rheumatoid Awareness Day on RAW, or visit this page at the Rheumatoid Patient Foundation site. Number 1 and 7 resonate the most with me. Newly diagnosed this past month, my husband and I are going to my first follow up appt this Friday. Both number 1 and 7, we are discovering, learning, accepting, and incorporating into our lives. Number 1 is what I’m starting to share with others, while I keep Number 7 in mind for their follow up questions and suggestions. 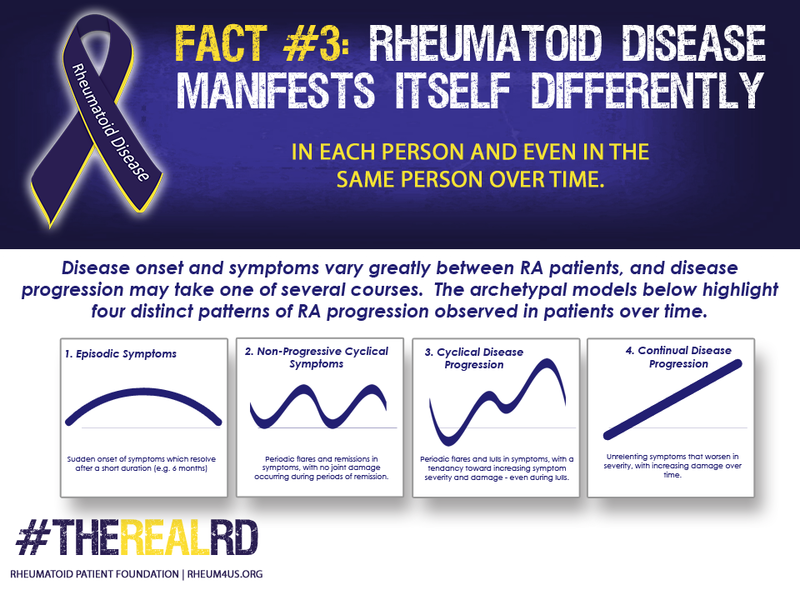 Numbers 1 and 7 are the bookends to most conversations about rheumatoid that we will have. I got my pin yesterday, thank you! I am wearing it proudly today. thanks Stacy. This is our first awareness item on Amazon & it’s brand new. When you have time, can you please post a review there saying the same? 5# Even family has a hard time with this. I think we make it harder on ourselfs because most try and keep a good attitude. Not acting like we really feel. Kelly praying for you. Two years into my diagnosis, I would say 1, 3 & 6 resonate the most with me. I’m still learning about RD & it is difficult when it is so different for each person. The medicines used to treat the disease are scary, I haven’t yet found a doctor I’m really confident in and I understand how difficult it is from their perspective when there are so many variables to deal with for each patient. I can only hope that I’m going in the right direction with my treatment because the long-term outlook with RD is enough to make me really worry about my future & my family’s future. 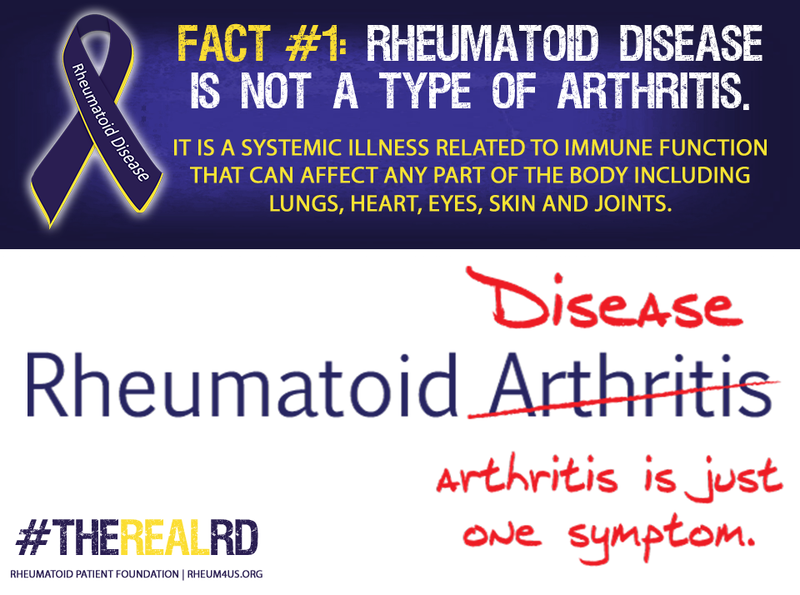 PEOPLE SHOULD REALIZE THAT RHEMATOID ARTHRITIS CAN KILL A PERSON REALY FAST IF THEY ARE NOT EDUCATED ON THE FACTS OF THIS DEADLY DISEASE. OSTEOARTHRITIS WILL CRIPPLE YOU AS IT EATS AWAY AT THE CARTLIDGE THEREFORE REQUIRING JOINT REPLACEMENT. I AM THE WORST CASE HISTORY RECORDED IN THE MEDICAL FIELD WITH RHEMATOID ARTHRITIS. 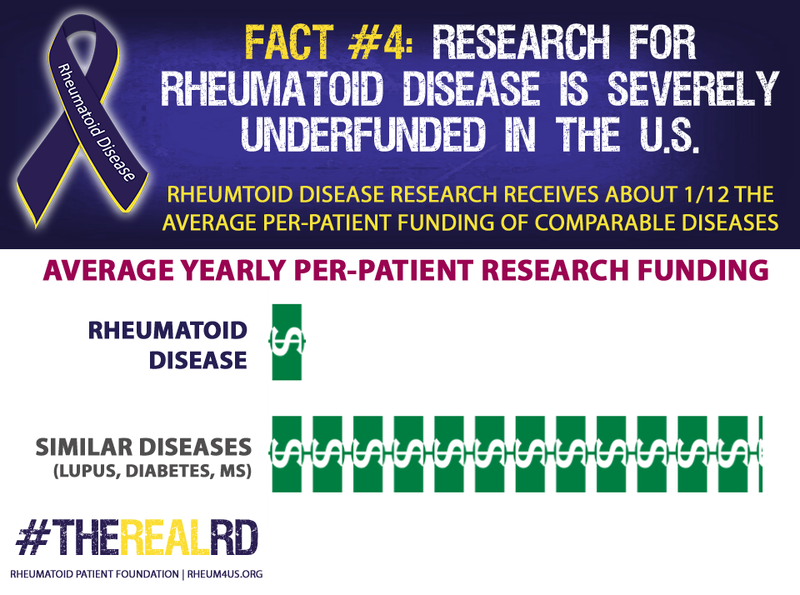 I HAVE STAYED QUITE ABOUT RHEMATOID ARTHRITIS FOR YEARS BUT NOW I AM GOING TO TRY AND EDUCATE PEOPLE ABOUT THIS DEADLY DISEASE. IT HAS PUT ME ON MY DEATH BED 4 TIMES AS I HAVE BEEN THROUGH OVER 50 DIFFERENT SURGERIES. 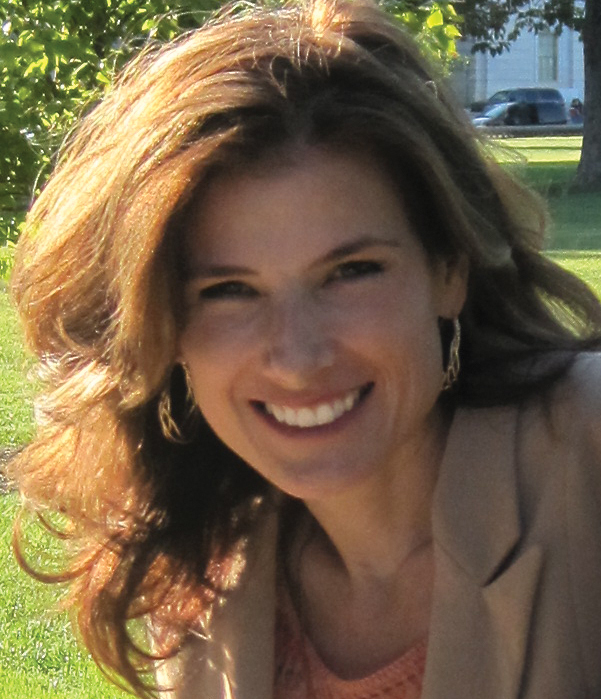 I HAVE BEEN ASKED TO WRITE A BOOK O MY PAST EXPERIENCE BUT I AM NOT VERY CAPABLE OF DOING IT. I WOULD RATHER WATCH SOMEONE LIKE YOU DOING THE GOOD WORK KEEP IT UP.